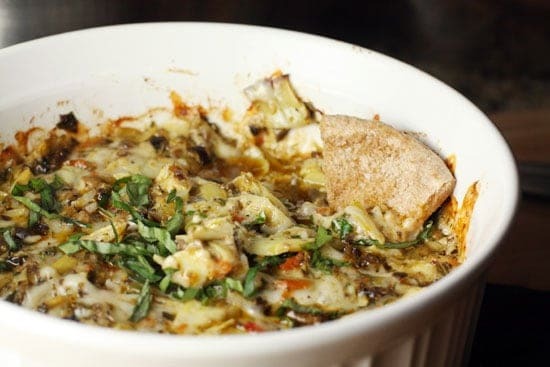 This is one of those special dips (you know the kind) that takes practically no time to prepare but gives the impression that you were slaving away for hours peeling artichokes and chopping olives. It also won the poll last week! OK. Actually, if you can convince someone that you peeled like 20 artichokes then you are partying with the most gullible person on the planet. But still, people will be impressed because it’s a delicious thing and the flavors are fairly complicated considering it’s really only a few ingredients tossed together and baked up. A quick and tasty dip that’s guaranteed to please your guests. Would be great for a holiday party! 1) Preheat the oven to 400 degrees. 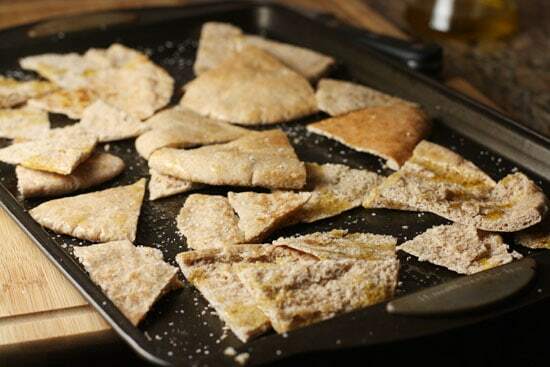 Cut pita chips into sixths and peel apart each side. Each pita should make 12 chips. Lay out chips on two baking sheets and drizzle with oil and a pinch of salt. 2) Cook pita chips for 10-15 minutes, stirring once until they are a light golden brown. They will continue to crisp up out of the oven as they cool. 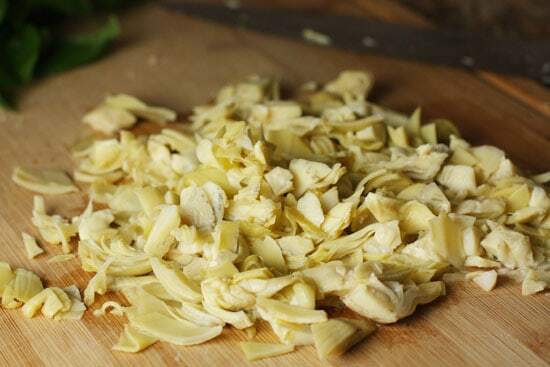 3) Drain and chop artichokes and chop basil and pepper if using it. 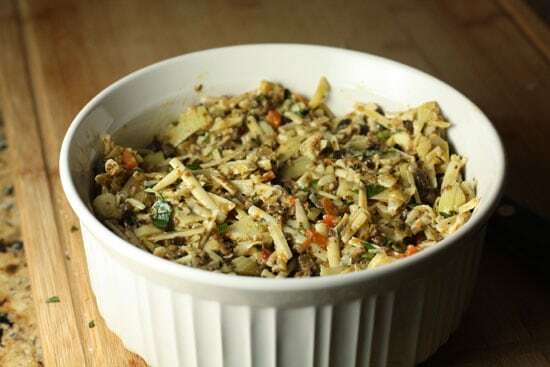 4) Add veggies in a medium bowl with olive tapenade and grated cheese. Stir to combine and pour into a 9×9 baking dish or a 2 1/2 quart round or oval dish. 5) Bake at 400 degrees for 30 minutes until bubbling and browned around edges. 6) Let cool for a few minutes then serve immediately with pita chips. This dip is so simple to make that the least you can do is make some nice, homemade pita chips for your guests. Of course, if you’re in a crunch, you can buy some or also just serve the dip with crusty bread. But homemade pita chips are so easy and delicious that it makes sense to me to make them any time I get the chance. Just chop up 5 or 6 pitas into sixths and then peel apart the two sides of each sixth. So each pita should make 12 chips. They won’t all be perfect and that’s okay. Then lay them out on a baking sheet (probably need two) and drizzle the pita slices with olive oil and a pinch of Kosher salt. Bake at 400 degrees for 10-15 minutes, stirring once halfway through. Just be sure not to burn the chips though. They’re done when they are slightly golden brown. They will continue to crisp up as they cool out of the oven also. Literally, that’s about the hardest part of this dip. Good thing we got it out of the way. This could be an incredibly hard dip to make if you peels all the artichokes from scratch and made the olive tapenade from scratch, but we’re going to do neither of those things. Oh. And if you don’t love olives, you can cut back on the tapenade or replace it with sun-dried tomatoes. The original recipe just called for like 1/2-3/4 of a cup of tapenade, but I wasn’t going to keep a tiny jar of tapenade which would quickly get lost in my fridge so I just used the whole jar. It’s okay to cheat here. 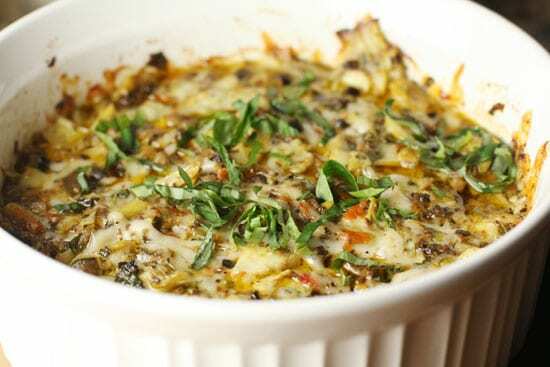 Chop up your pepper and basil and grate your cheeses. If you’re using the Serrano pepper, dice it pretty tiny so someone doesn’t get a big bite of heat. For the artichokes, just drain them and roughly chop them up. Easy enough. Again, canned or jarred is what you want here. Combine everything in a big bowl and stir it together! There should be plenty of salt and oil from the tapenade but give it a quick taste anyway and adjust. 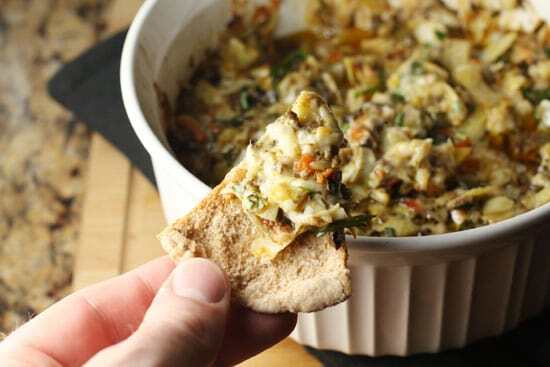 I used two kinds of cheese (Asiago and Monterey Jack) for this dip. I figured the Asiago would give it some nice flavor and nothing melts like Monterey Jack so it’s always good to throw into a dip. There’s enough oil in this dip that you don’t need to worry about greasing your baking dish at all. Just fill it up! Bake this guy at 400 degrees for about 30 minutes until bubbling and browned around the edges. If you want to get fancy you can sprinkle some more chopped basil on top just to make it pretty. A sprinkle of basil to make it pretty. You’ll want to let this cool for a few minutes before diving in, but man is it good. This is a really nice fall dish. It uses mostly canned/jarred stuff and is completely warming. If you make this though, I highly recommend the homemade pita chips. They’re maybe the perfect chip for this dip. Super easy and delicious?! I'm in heaven! Totally making this for the weekend. Yum! Stop being such a prude and show us your new kitchen already! This sounds interesting. I'll have to give it a try and maybe bring it to some of the multiple holiday dinners we have to attend the next couple of months. Does it seem like it would be good for a potluck type situation? 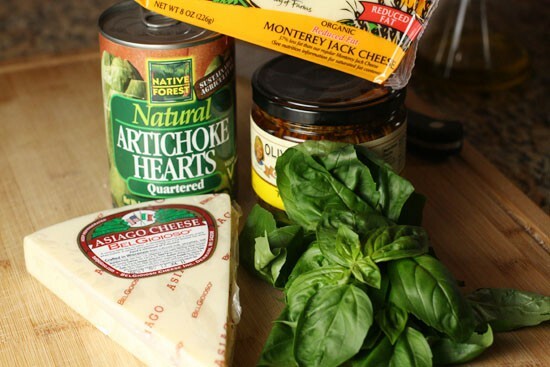 This sounds really good – but canned artichokes have so much sodium (I always rinse them) whey would you add more salt???? Do you mean jarred artichokes? I don't think canned artichokes have that much salt. Either way though, the olive tapenade also has a lot of salt. As a rule you should always taste a dish like this before and after you salt it. It may not need it at all. "if you can convince someone that you peeled like 20 artichokes then you are partying with the most gullible person on the planet. " …..so quickly offer them a deal on some swamp…..errrrr "prime marine farming" land. I'm making it now for a party tonight. 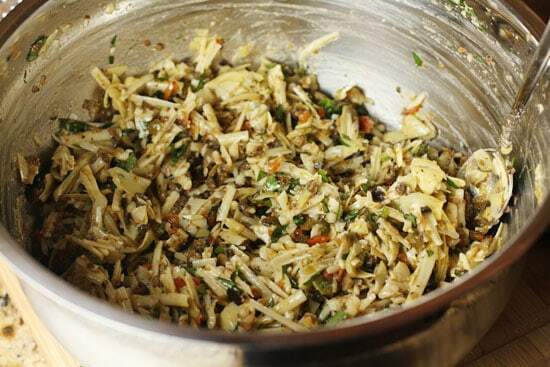 « Liver and Onions (and Peppers and Potatoes) Recipes Home » The Internet Kitchen: Yard Work!